Often considered the founder of the academic discipline of "Media Studies," Marshall McLuhan coined many terms and phrases that have become common over the past half-century with the explosion in the development of communications technology. He is often noted for declaring that "the medium is the message." This provocative and paradoxical statement was McLuhan's way of calling attention to the fact that the communication of a message, in reality, is not simply the pure transference from one mind to another of intelligible content; a message is conveyed through forms of mediation (media) that create an environment within which communication takes place. 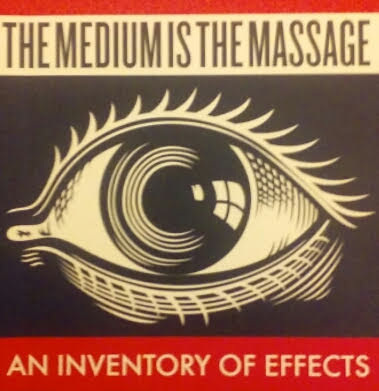 On the left, we have reproduced a segment of the cover of McLuhan's 1967 book The Medium is the Massage. Wait..."massage" with two "a's?" I just said "message" before. But look closely at the title. Is it a mistake? What appears to be a typo in the book's title was actually an ironic twist on the famous phrase, which McLuhan employed to refer to an increasing phenomenon of the 1960s, namely, the constant immersion of people in the media technology of television and advertising. These "non-linear," surrounding, "involving" presentations of rapid images and conceptual associations massage us (manipulate us?) consistently throughout the day. Our minds adopt "positions" or change them, through being "worked over" in ways we don't even notice. That was in 1967. McLuhan died in 1980, but he predicted the broad outlines of the ongoing 21st Century communications revolution, including the development of portable and widely accessible interactive multimedia technology. Whatever gadget you are using to read this today, it would not have surprised him. 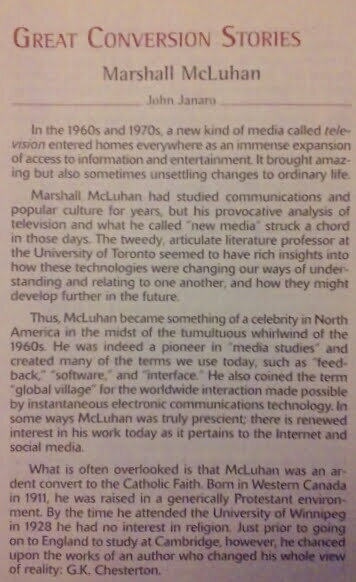 McLuhan's project was to understand how media work, and the impact on human experience of "new media" (his term, which he originally intended as a reference to what are now "old media" systems like television and computer data). 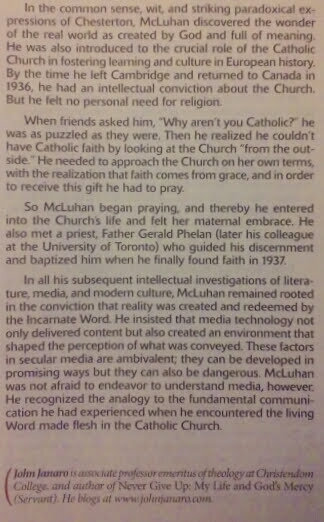 He was primarily descriptive and exploratory in his methodology (as is suggested by the title of his groundbreaking 1964 book Understanding Media); but when his studies spilled over beyond academia into popular culture in the late 1960s, McLuhan himself became something of a "media celebrity," and was often taken as an advocate of that which he intended to describe. In fact, he was anything but the ultra-hip utopian futurist prophet some might have wished him to be. McLuhan was a firmly grounded realist. He saw both the potential and the great dangers of new media technology, the gains and the inevitable losses and possible perils it entailed for the human experience. He was inclined, in fact, to be more pessimistic about what he saw emerging in "the global village" (another McLuhanism). He hoped that a thorough understanding would assist a more conscious, reflective, responsible, and balanced use of media—that it would lead to the cultivation of a media ecology (a project all the more necessary and urgent in our time). Though it is not well known, McLuhan's methodology was grounded in a worldview much deeper than media studies, psychology, or even the academic disciplines of the sciences and humanities. While still young, he had entrusted his entire life to that super-exemplary, fundamental, definitive, mysterious and fully human mediator who is Jesus Christ crucified and risen, living in His Catholic Church.